The Velcro finger switch (left) is custom made to insert into the front panel of IntelliSpense™ dispensers, with the exception of the Foot Pedal Valve or Digital High Volume Air dispensing systems. The velcro strap is designed for use with pneumatic IntelliSpense™ Syringes, as well as any other brand of standard pneumatic syringes. The electric foot pedal is included with every analog or digital syringe dispenser, or with the cartridge dispensing stations. The finger switch can also be used with either system. Sometimes replacements can be needed, and sometimes it can make sense to work with a finger switch instead of a foot pedal. Contact an IDS representative to discuss your needs at any time. The 9991439FS Finger Switch attaches with a Velcro belt and triggers the dispenser with a touch of the button. 5 foot length standard cord. 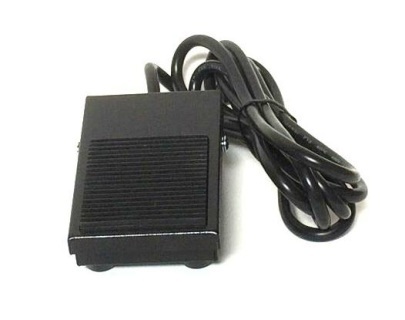 Do not use both the foot pedal and finger switch at the same time. ​Intended for use with Analog and Digital IDS dispensers. Not for use with Valve Systems or Pedalspense system. 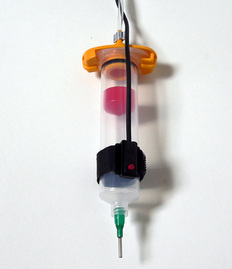 Order the necessary adapter heads, syringes, needles and tips separately.